Shoulder woes have slowed Zimmerman in the same way that they did Scott Rolen, but the Nationals have moved Zimmerman to first, where he won’t have to make as many throws. The end result should be a healthier, productive season; although, a thigh and fractured finger were the primary injuries that allow Zimmerman to play in only 61 games last season. This will the the 11th season in a Nationals uniform for Zimmerman, and this is his age-30 season. Don’t consider him washed up. 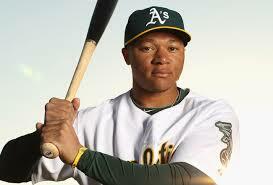 He is locked in at .280/.350/.480 with about 25 home runs and 85 RBI in a dynamic lineup. 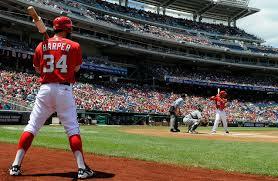 Harper isn’t going to make anyone wait for an eruption this season. Duh, right? At 22, Harper is ready to continue his assault on opposing pitchers, but THIS is the year that he reaches 30 home runs and stays healthy. What is he capable of when he stays on the field and has Anthony Rendon, Ryan Zimmerman, Jayson Werth, Wilson Ramos, and Ian Desmond on the field with him? This is a dangerous lineup and Harper has the potential to be the most productive player in that lineup. This is the year that he starts heading towards that ceiling, closing in on a .300/.400/.500 line, while increasing his power output as he becomes more physically mature. Offseason Overview: When you have five very good starting pitchers and you’ve won 96 games, what do you really need to do to improve? Well, sign the best free agent pitcher on the market to a seven-year, $210 million deal, which is what they did when signed RHP Max Scherzer. The move pushed Tanner Roark (15-10 with a 2.85 ERA and 1.09 WHIP in 31 starts) to the bullpen, while making LHP Ross Detwiler expendable, as he was shipped to Texas for a couple of prospects. The Nationals didn’t need to do much to improve their team, but they still made a huge splash and got better. The Verdict: A healthy Zimmerman and Werth will help the Nationals to 100 wins, but it will be Harper, Rendon, Desmond, and the pitching that will get them to 95 wins. This is the best team in baseball, regardless of PECOTA projections. The pitching is elite and they have Roark ready in a swing role and A.J. 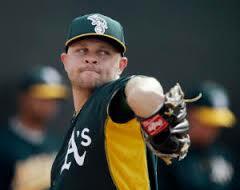 Cole ready in Triple-A. With Lucas Giolito and Joe Ross likely to start the year in Double-A, they are far off from making an impact, either. Michael Taylor, a powerful, speedster, will be taking over center for the first several weeks with Denard Span on the shelf. The Nationals are very good, and this is the year that they put it all together. For my 500th post, I decided I’d go away from the previews for a moment and look forward to the season in a different way, with my annual predictions and useless guesses. While there are other, more important analysts who gather data and use systems to generate these types of lists, I just use the ol’ noggin. You can find my 2012, 2013, and 2014 versions to see how I did in the past, but this is a new season and a new idea on how the league will look at the end of the 2015 season. 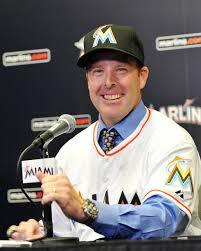 AL Manager of the Year? 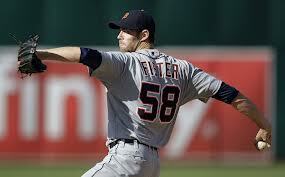 The Detroit Tigers lost RHP Max Scherzer to free agency and RHP Rick Porcello in a trade. Sure, they still have LHP David Price and they added OF Yoenis Cespedes to their offense, but this will be a new AL Central, one that will be very competitive, and will have a division winner who isn’t Detroit for the first time since 2010. 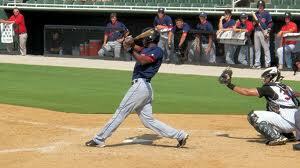 The Indians have a very intriguing team, full of youth and talent, with much of that talent still not totally tapped. The rotation has reigning Cy Young winner Corey Kluber, with RHPs Trevor Bauer, Danny Salazar, and Carlos Carrasco behind him, while healthy seasons out of Michael Bourn and Nick Swisher will add to the production of Carlos Santana, Jason Kipnis (who should rebound from a lousy 2015), and Michael Brantley. 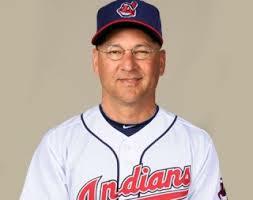 All Francona needs to do is utilize the talent, which is something that he is an expert at doing. Cleveland will win more than 90 games and have their first division title since 2007. The NL East is going to be down…way down. The Nationals will likely win the division by ten or more games, but the Marlins will be competitive, and Redmond will look very intelligent by being in the position as the field general. He has Giancarlo Stanton and his massive power to lead an offense that has quite a bit of talent. Christian Yelich will solidify himself as one of the top outfielders in the NL this season, and Marcell Ozuna will round out the outfield with his impressive power in center; however, it doesn’t stop there. With Mike Morse providing more power at first, Martin Prado being acquired to handle the hot corner, Adeiny Hechavarria‘s slick glove at short, and Dee Gordon‘s blazing speed at second, the Marlins will shock a lot of people. The possible mid-season addition of Jose Fernandez to the rotation could push them over the top, as Henderson Alvarez, Mat Latos, Dan Haren, and Jarred Cosart hold down the fort until then. The Marlins are a solid team, and after the Mets lost Zack Wheeler, the Braves went into rebuild-mode, and the Phillies continue to be awful, they’ll be the only team capable of hanging around Washington in the NL East in 2015. McCutchen continues to be an incredible producer, hitting the elite .300/.400/.500 level the last three seasons, while having a unique blend of power and speed. 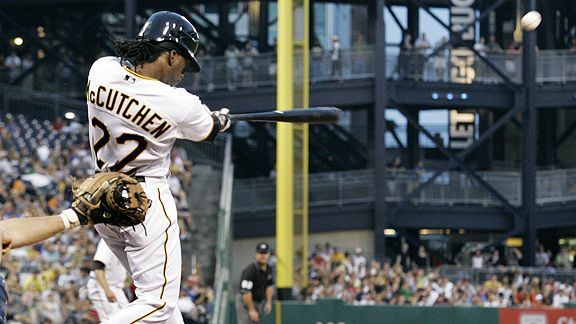 He is the leader of the Pirates outfield, which could become one of the greatest outfields in the history of baseball with Starling Marte and Gregory Polanco reaching their peak years of production in coming seasons, but McCutchen will continue to be the anchor of that group, and of the Pittsburgh franchise. The 2015 season won’t be any different for this superstar, who will win his 2nd MVP award in his age-28 season, leading the Pirates to the top of the NL Central. Could he REALLY be getting better with age? The last several seasons, I didn’t want to believe. I questioned Kershaw in the past due to his higher walk rates, so I kept thinking that the NL West would belong to Giants’ left-hander Madison Bumgarner. While Bumgarner had an incredible run last season, he can’t carry Kershaw’s jockstrap, and it’s likely that we’re watching the closest thing to Sandy Koufax that our generation will ever see. It is just coincidental that Kershaw has the Dodgers uniform and left-handed delivery in common, and, hopefully, those are the only similarities that we will see between the two. Kershaw is gifted, and he is a gift to baseball fans. He will continue his dominance in 2015, likely winning 20 games again due to his incredible individual talent, as well as the talent behind him on the field. 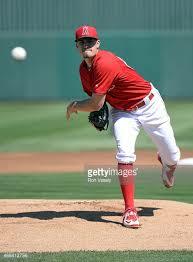 Getting Andrew Heaney for Howie Kendrick may go down as a coup for the Angels. Not only did they free the payroll of $9.5 million, they got a major league ready arm with a half-a-dozen years of team-control to put into their rotation. While Heaney doesn’t have No.1 starter stuff, he is quite capable of having a long, successful career. He’ll begin that run of success in 2015 on Day One, and while Josh Rutledge and Johnny Giovatella aren’t as good at baseball as Kendrick, it was a deal that the Angels had to make, as they don’t have the talent in the minor league system to improve their rotation, and they needed that youth with C.J.Wilson aging quickly and Jered Weaver not getting any younger. 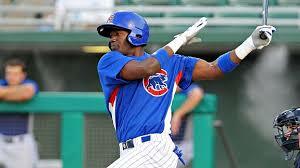 Many will be swinging on the coattails of Kris Bryant, I’m all aboard the Soler bandwagon in 2015. He has incredible power and he managed to bulk up his already impressive physique over the winter. 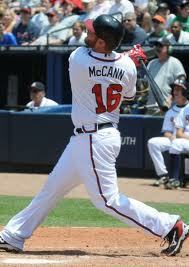 In his age-22 season, he reached the majors and combined to hit 20 home runs and drive in 77 runs in 86 games and 333 plate appearances over four levels. 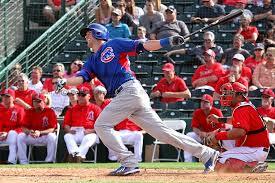 If Soler stays healthy, he will have better numbers than Bryant, and he won’t be spending the first month in the minors. The end results will be impressive, even for a 23-year-old who will need to adjust to the league having tape on him. Johnny Cueto will be on the Boston Red Sox by the trade deadline, as the prospects would be more valuable to the Reds than a draft pick. Trevor Bauer and Danny Salazar will combine for over 340 strikeouts, 27 wins, and 59 starts covering 390 innings for the Cleveland Indians, but Corey Kluber is still their best pitcher. 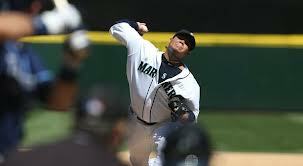 Masahiro Tanaka will not make 15 starts before he finishes the tear of his UCL and has Tommy John surgery. Gerrit Cole will finish in the top three in the NL Cy Young – behind Kershaw and Bumgarner. Xander Bogaerts will hit 20 home runs and drive in at least 75 runs at the bottom of the Red Sox order. Drew Hutchison is the top pitcher on the Blue Jays, and a top 30 starting pitcher, while Daniel Norris and Aaron Sanchez flop in their roles at the back of the rotation. Addison Russell finishes the season as the Chicago Cubs starting shortstop when Starlin Castro is traded for young pitching at the trade deadline. Jose Ramirez is so valuable to the Cleveland Indians that they don’t call-up Francisco Lindor until September. Joc Pederson hits 25 home runs and steals 30 bases while striking out over 160 times and posting a batting average under .250 – George Springer-lite. Justin Verlander rebounds and posts an ERA under 3.85, a WHIP under 1.30, and more than 190 strikeouts in 215 or more innings. 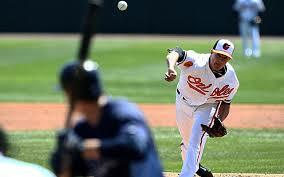 This is the year Gausman becomes an ace…right? 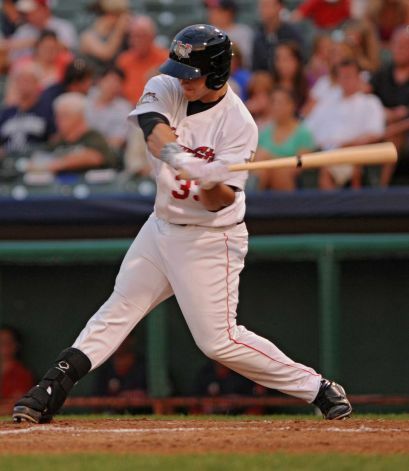 Jake Lamb, 3B, Arizona Diamondbacks: if Yasmany Tomas has hands of stone and can’t handle third, Lamb will, and he has managed to hit .321/.406/.553 in 1,079 minor league at-bats. Nolan Arenado, 3B, Colorado Rockies: Arenado makes contact, plays in a hitter’s paradise, and will see many of his doubles turn into home runs as he matures. He’s well on his way to becoming elite. Eduardo Rodriguez, LHP, Boston Red Sox: Clay Buchholz is bound to be hurt, Joe Kelly is questionable (at best), and Justin Masterson may never rebound to his 2013 form – enter this guy. Nathan Eovaldi, RHP, New York Yankees: Huge fastball, tremendous gains in his walk-rate, and he will begin to miss more bats. He’ll end up being the Yankees’ top starter due to Tanaka’s injury. Collin McHugh, RHP, Houston Astros: Even after finishing 4th in voting for the AL Rookie of the Year in 2014, McHugh may sneak under the radar. His 9.1 K:9 and 6.8 H:9 are for real. He could, sneakily, become the next Corey Kluber. Raisel Iglesias, RHP, Cincinnati Reds: He struggled with command in Cuba, but he has electric stuff, a strong repertoire, and a spot in the Cincinnati rotation. As bad as they look on paper, he has plenty of opportunities for run support with a healthy Joey Votto, Jay Bruce, and Todd Frazier. Jesse Hahn, RHP, Oakland Athletics: Hahn posted solid numbers in 12 starts for the Padres in his age-24, rookie season in 2014, but he’s going to a similar offensive-drowning park in Oakland, with a very talented roster behind him. 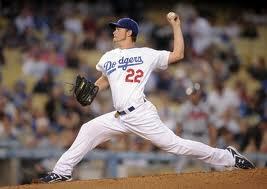 He could be a top 30 starting pitcher by the end of the season with his strikeout potential. Alex Gonzalez, RHP, Texas Rangers: Better known as “Chi Chi”, Gonzalez, a former 1st round pick out of Oral Roberts in 2013, has been a quick-moving prospect for the Rangers, reaching Double-A Frisco last season, with good reason. He has a mid-rotation ceiling, but with the Rangers desperate for healthy pitching with their sudden curse on their roster and talent, Gonzalez could get a long look, showing enough talent to be roster-worthy in fantasy leagues. The Washington Nationals have signed right-hander Max Scherzer to a seven-year, $210 million contract, shocking the world of baseball by locking-up the market’s top free agent arm, while creating a new philosophy in negotiating tactics that could influence free agent signings in the future. By extending the $210 million over 14 years by deferring $15 million per year, they also free up a bit of payroll for additional signings in years to come. Perhaps that deferred money will allow them to lock-up Bryce Harper, who will be a free agent after the 2018 season; however, in the moment, this deal does much more for the Nationals than make them creative, financial gurus. Max Scherzer will now lead the Washington rotation, a rotation that already featured Stephen Strasburg, Jordan Zimmermann, Gio Gonzalez, Doug Fister, and Tanner Roark. Obviously, depth in a starting rotation is always nice to have, especially with two pitchers on club’s roster already having Tommy John surgery on their resume (Strasburg and Zimmerman), and Gonzalez having dealt with some shoulder issues last season. What is truly incredible about the Scherzer signing is that Roark appears to be the man who would be bumped from the rotation, even after the 15 wins and 2.85 ERA over 31 starts in his age-27, 2014 season. The Nationals have the flexibility to deal an arm, with Jordan Zimmermann already rumored to be the one who could be moved. #RedSox will make a ‘strong push’ for Jordan Zimmerman, according to sources. The Red Sox certainly have the prospects to make a deal for Zimmermann or any other player in baseball, so this isn’t all that surprising. Mookie Betts would make an excellent long-term second baseman – if the Nationals are content with moving Anthony Rendon to third base long-term, and the club doesn’t, or any club this side of the Dodgers, doesn’t appear capable of locking up a Scherzer/Zimmermann/Strasburg trio to the nearly $90 million annually that it would require. Zimmermann, who is due $16.5 million prior to reaching free agency after the 2015 season, arguably, is worth the same type of deal that Scherzer received and possibly more. Zimmermann is Player A and Scherzer is Player B. Those strikeouts are certainly a big difference, but Zimmermann is just as dominant in overall numbers – outside of the swing-and-miss stuff. Still, the Nationals sit here today with the most feared starting rotation in baseball. Just a week ago, ESPN’s Buster Olney had Washington atop his top 10 starting rotations in baseball, and that was BEFORE the club added Scherzer. As long as Washington is able to produce some runs in 2015, they appear to be capable of winning 100 games. The rotation, as is, features five pitchers capable of 15 or more wins and ERAs under 3.20, so if Jayson Werth, Harper, Rendon, Ryan Zimmerman, Ian Desmond, and company can do their part, this is a very, very dangerous team. The rich continue to get richer, which appears to be a theme in Major League Baseball, and while the Tigers lose Scherzer from the rotation that they had in 2014, they still have one season with David Price at the top before they need to panic. 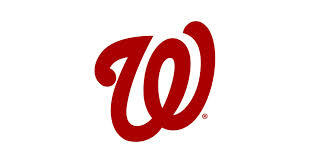 The Nationals don’t look like they’ll be in that position for several years.